The beautiful flat rock lizards from Africa are a group of lizards I've wanted for years. I am still very much a newcomer to these lizards. Thus far, I've kept either a mature male and female (or possibly an immature male?) for approximately 6 months. 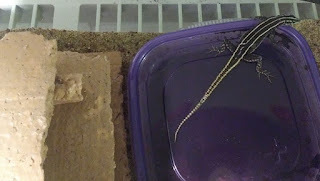 These are very active and fast lizards that thus far seem quite hardy in captivity. There are several species and sub-species and I am unsure which I actually have. Basically, in the USA, the larger species (Platysaurus imperator) is sold as the emperor flat rock lizard and anything else simply as a flat rock lizard. I prefer the smaller variety that I have simply because they use a little less space. Being that I am relatively new to these lizards, my setup may or may not be ideal for them. However, I will tell you how I've been keeping them so far. I have seen them basking at 93F so I believe they should be housed in an enclosure large enough to generate a fairly hot basking spot, yet cool enough for them to cool down into the low 70s should they choose. A zilla 40 gallon or similar sized (36"x18"x16h") terrarium with a secure lid should work well. They need crevices to hide in and will likely hide about 60% if the time. The other 40% will be spent running around the enclosure or basking. Make sure the lid is secure and any access doors shut, they love to run upside down on screen and they can jump reasonably high and grab onto screen. For a substrate, I use play sand. I also include a moist hide that is easily accessible. Although I've never seen them use it, I figure it cannot hurt to provide an egg laying and shedding site should one ever be needed. Clean water is always available from a swallow dish and I mist mist them twice per week. One thing I have done with mine is wrapped the cage with a dark paper which is taped on so that they cannot see me constantly. I feel like this may provide them some extra security. They have a fresh UVB bulb that is within the manufacture's recommended distance ranges and replaced a little more often than suggested by the manufacture. I like the zoo med bulbs as they've been around for a long time and have a good track record of being a fairly solid product. Feeding these lizards is when you see just how fast they are. I feed mine mostly crickets and it is interesting to observe them darting around the cage to catch them. The crickets are gutloaded on medication-free chick feed for at least 24 hours before feeding. I dust them with calcium most of the time and fresh ZooMed Reptivite at least once a week. They will sometimes take mealworms from a swallow dish and they will eat soldier fly larva that I drop in front of them. These lizards aren't for everyone. They are definitely not a pet that can be handled and they strike me as being best suited for a quite area away from constant disturbances. They are a very pretty species that will come out to bask and feed while a quite, careful approach allows one to view them.